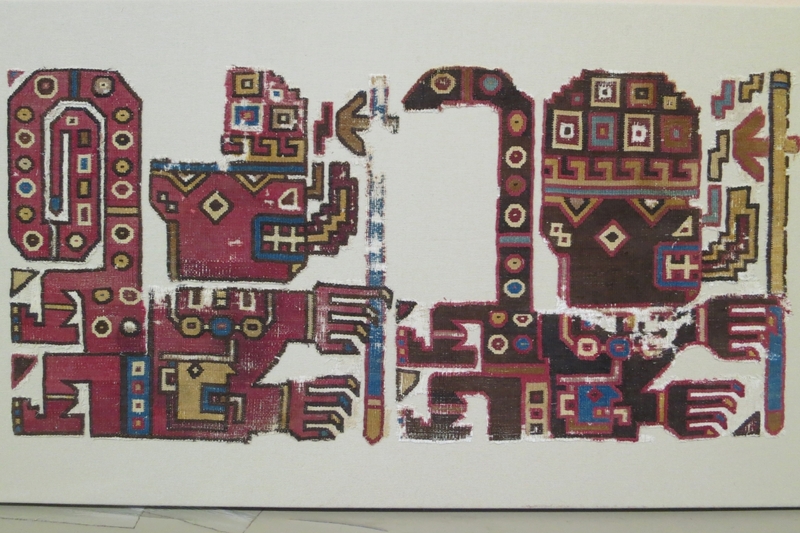 Textile fragment, Huarmey Culture, Peru, circa 850-1000 ad, fragment dimensions, 10 x 21 inches, mounting dimensions 14 x 26 inches. Alpaca supplemental weft patterning on a cotton plain weave round. The Huarmey Culture, on the northern coast of Peru was strongly influenced by the Wari culture - the dominant culture of that period in Peru. Huarmey textiles are uncommon and mainly exist as fragments. The scale of the figures in this fragment are atypically large.